12/1/15 - 1/1/16 | sweet juniper! 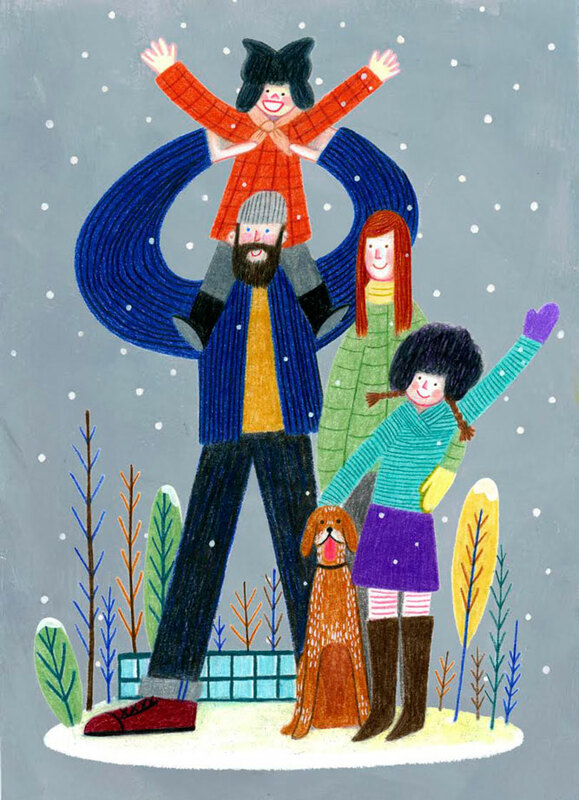 It has become our tradition to commission an artist every year to do a family portrait for our holiday card. Part of the fun is looking at the portfolios of so many amazingly talented illustrators out there and then working up the nerve to ask for the commission. I don't know where I first came across the work of Yinfan Huang, but I started following Yinfan on Instagram months ago and I really grew to love the playfulness and joy in her work. She is originally from Guangzhou in China, but now works in New York City and you should visit her website, blog, instagram, and etsy shop to see more. We LOVE the card she made for us this year, and those of you following me on instagram will recognize some of the hats and clothes she chose. My son is getting so big I don't know how many more years he will be able to ride on my shoulders like that, so I will cherish this image forever. As the kids have grown older and the blogging world has become so different, I've shied away from sharing as much as I once did here. But I hope this year to write a bit more. I do appreciate this opportunity to check in and let everyone know we're doing great and I hope everyone else had a wonderful year as we look forward to the next one.